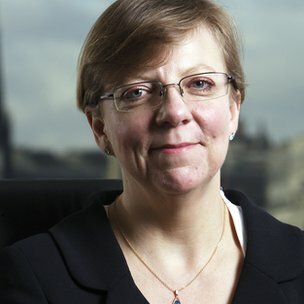 Following last week’s news that there is a new Lord Chief Justice, we have the announcement that there is a new DPP – Director of Public Prosecutions – step forward Alison Saunders CB. There’s a profile of her here if you want some background. No, CB. Ms Saunders was appointed a CB – a Companion of the Most Honourable Order of the Bath for her work in relation to keeping the courts going during the riots in the summer of 2011. Ms Saunders was head of CPS London (her current post). It’s likely that she will be upgraded to Dame Alison in due course. It would not be a surprise if she is also appointed a QC (even if an honoury one) at some point as well. Ms Saunders is the first ‘internal’ DPP – previously, the DPP has been a QC from the independent bar (apart Sir Theobald Matthew, who was a solicitor – the only solicitor DPP – in independent practice when he was appointed in 1944). Ms Saunders joined the CPS pretty much when in started in 1986 and has worked there ever since (apart from a short stint in the Attorney-General’s office). Good to see a woman get a top job after another male Lord Chief though? Yes certainly. Although Ms Saunders is not the first female DPP. That honour goes to Dame Barbara Mills QC, who was DPP from 1992 to 1998. What does the DPP do? They are head of the CPS (an organisation that employs about 7,000 people with a budget of £650 million) and “set the vision and policy for them“. Ms Saunders will be involved in making decisions as to whether to prosecute in some of the most serious and sensitive cases. They are also the ‘public face’ of the CPS – you will be seeing a lot more of Ms Saunders in the next five years. The DPP reports to the Attorney-General, who is accountable to Parliament for her actions. There’s lots more information in the CPS Annual Reports. Significantly more than most criminal lawyers! Currently it’s £198,674 a year (compared to an average of £25,000 for legal aid lawyers) – it’s pegged at the salary of a Lord Justice of Appeal as well as a pretty good pension. Who says crime doesn’t pay, eh? This entry was posted in In the news and tagged cps, DPP on 23/07/2013 by Dan Bunting. passed details of the case against her father to her. stopped because she felt “uncomfortable”. in him “in order to gain favour with your girlfriend”. a strong deterrent element to the sentences. necessitate a much higher sentence. probably much less than 6 months. of 12 months in prison? This entry was posted in Current Awareness, In the news and tagged cps, misconduct, misconduct in public office on 06/06/2013 by Lyndon Harris.